Our Lady of Guadalupe Catholic Church and Flagstaff Nuestras Raíces invite the public to attend its second annual “Flagstaff Summertime Tardeada” fiesta from noon to 10 p.m. Saturday, June 27 to celebrate and recognize Flagstaff’s Hispanic roots. What is a Tardeada? It’s a vibrant afternoon festival and social dance celebrating Flagstaff’s Hispanic culture and community history. 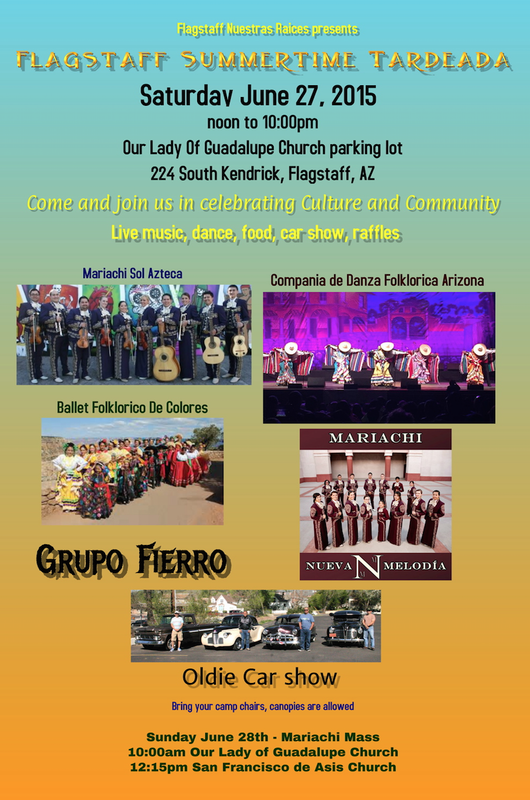 The Flagstaff Summertime Tardeada will take place at the parking lot of Our Lady of Guadalupe Church, 224 S. Kendrick St., Flagstaff. The church is a significant site because it was the pride and centerpiece of the Hispanic community when it was built in the late 1920s by Flagstaff Hispanic pioneer families, who had strong bonds to the church. The festival’s goal is to celebrate the legacy of Flagstaff’s Hispanic culture through entertainment, music, dance, art, food and exhibits. The entertainment stage will feature Ballet Folklorico de Colores – Flagstaff; dance music presented by Grupo Fierro; Mariachi Nueva Melodía from Tucson; Compania de Danza Folklorica Arizona from Tucson and the showcase group, Mariachi Sol Azteca from Tucson. There will also be an “Oldies” car show (from the early ’60s back to the 1940s). The event will also include a tribute to Hispanic pioneers and Hispanic veterans in the region, free activities for children and a raffle (Must be present to win). Mexican and regular barbeque food will also be sold as a fundraiser for the Flagstaff Nuestras Raíces’ Cultural Heritage Fund. Bring your chairs. Canopies are allowed. A Mariachi Mass will then be held at 10 a.m. Sunday, June 28 at the Our Lady of Guadalupe Catholic Church with Mariachi Sol Azteca. That will be followed a second Mariachi Mass at 12:15 p.m. Sunday, June 28 at San Francisco de Asis Church, 1600 East Route 66, Flagstaff.